Marketing That Matters | Emphasis on Excellence, Inc.
Meggin presents practical ideas broken out by how much time and / or money are required - Meggin gave me some great ideas I hadn’t thought of! Do you want to have more of the “business” that is “just right” for you? Would you like to be working with “ideal clients” each and every day (and ONLY these perfect clients)? Can you imagine the difference you could make when it is SRO (standing room only, figuratively or literally) anytime you offer a workshop, teach a class, or do a presentation? If you would like to learn ways to market so it matters, thereby increasing your impact (whether that means students in your classes, people buying your books, professionals hiring you for your services, or any other endeavor in which you’re involved) then you need to access this special webinar! Yes I would recomend the ‘Marketing that Matters’ class because i found it moved along at a good pace, had a lot of good content and a lot of good suggestions that I can put into practice right away. Learn ideas that you can put into place immediately and for as long as you are in operation! Making sure you know why and HOW to market is worth much more than $79… especially if you wonder if you have that much to invest! Oh, and if you think you don’t need to market, to paraphrase John Jantsch, ‘every enterprise is a marketing enterprise!’ If you don’t market, your “enterprise” will be lost. You will be taken to Meggin’s secure shopping cart where you may pay with your credit card or PayPal. The class is only $79 and includes everything listed above. 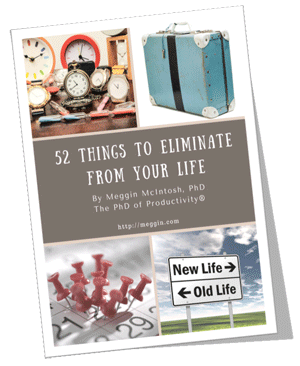 Dr. Meggin McIntosh is known for her humor and practical knowledge. She’s even been called “a little sassy.” You will have to decide on that last part for yourself, but the promise is that in this class, you will learn tips, tools, and techniques for marketing yourself, your work, and your services - without shoveling cash out the door. Oh, and did we mention that Meggin loves puffins? See what practical lessons you can learn from the puffin (and from a lover of puffins) about your marketing. Meggin is practical and whimsical at the same time. She always offers some ready-to-implement ideas, some profound ideas to think about, and her humor and approachability make it enjoyable! I learned how to market by trial and error - and then eventually began a more formal study of marketing. Whether I was marketing my regular classes or special workshops at the University or marketing the work I do now through Emphasis on Excellence, Inc., I know that if you don’t market well (or EEK, at all), then you will not have the impact you seek. Meggin’s teaching style, it’s those SMART principles - specific, measurable, action-provoking, reinvigorating and timely (yes I took some liberties 🙂 ).